Columbia Police Department (CPD) investigators have arrested two men and have arrest warrants for a third suspect in connection with a deadly shooting on Waverly Street from earlier this month. 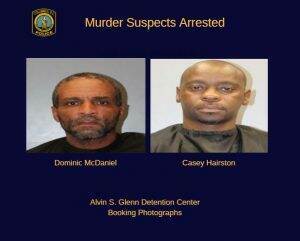 45-year-old Dominic McDaniel (DOB: January 1972) is charged with Murder, Attempted Murder, Attempted Armed Robbery, Burglary – First Degree, Criminal Conspiracy and Possession of a Weapon during the Commission of a Violent Crime. 39-year-old Casey Hairston (DOB: June 1979) is charged with Murder, Attempted Murder, Armed Robbery, First Degree Burglary and Criminal Conspiracy. During the course of the investigation, officers determin ed that the pair, along with 17-year-old co-defendant Dashawn Muldrow who is wanted by CPD, (DOB: June 2001) conspired to break into the victims’ home located at 2210 Waverly Street (Waverly Place Apartments) on October 5, 2018 to commit an armed robbery. Arrest warrants for Muldrow have been entered in to the National Crime Information Center (NCIC) database. He should be considered armed and dangerous. 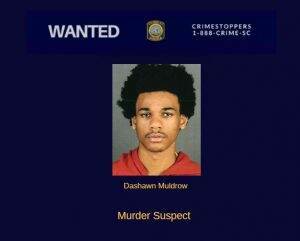 Once captured, the teen will be charged with Murder, Attempted Murder, Attempted Armed Robbery, Possession of a Weapon during the Commission of a Violent Crime, Possession of a Handgun by Person under the Age of 18, Unlawful Carrying of a Pistol, and Criminal Conspiracy. Anyone who is assisting Muldrow hide from CPD could also face charges. TEXT to CRIMES (274637), and mark the beginning of the message with “TIPSC,” followed by the tip information.